Last fall, my husband decided to try raising some pigeons. 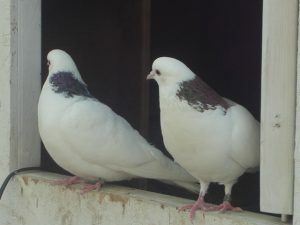 We now have four roller pigeons, and our newest aquisition, two homing pigeons. One of our pairs of rollers is brooding and has two eggs. The male has become quite protective and has chased the other pigeons out of the coop. He tolerates the chicken and her chicks, but I think he would prefer that they were not there either. It has been fun to watch the whole process. Zee brought the pigeon’s first egg in the house along with the chicken’s egg the day it was laid and I had him take it back out. I put it in a shoebox with so me sawdust and wood shavings to keep the chicken and chicks from stepping on it, but at the same time thinking that she would probably abandon it because it had been touched. The next time I went out to check on them I was pleasantly surprised to see her sitting on it. She has been sitting on it for a little over a week now, and from what I have read, it takes 18 days for a pigeon egg to hatch. 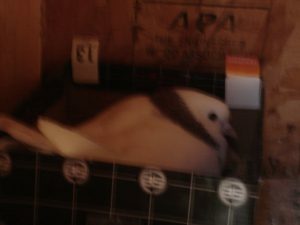 My husband took a peek in the nest the other day when she was off of her eggs and verified that there was a second egg. I don’t know if the first egg will hatch or not, since it was cold for a day before she started brooding, but from what I have read, that may not matter. I am thinking that we will probably need to get a second coop if we want to keep our birds all happy . . .